1. Ceremony Honoring the Mast of the U.S.S. West Virginia In Front of the Capitol Building, Charleston, W. Va.
Ceremony Honoring the Mast of the U.S.S. 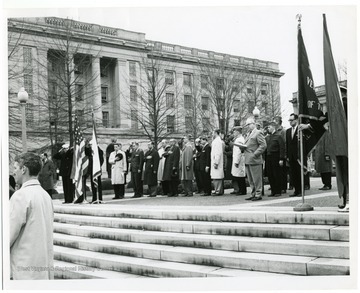 West Virginia In Front of the Capitol Building, Charleston, W. Va.
A group of men salute the American flag at a ceremony honoring World War II veterans and the U.S.S. West Virginia battleship. 3. 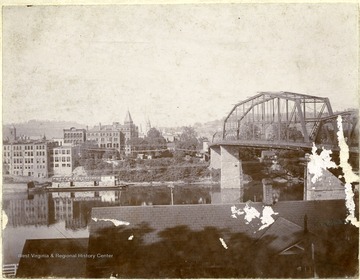 Chesapeake and Ohio Railroad Depot, Charleston, W. Va.
Chesapeake and Ohio Railroad Depot, Charleston, W. Va.
View of Charleston, West Virginia with bridge over river on right. 5. 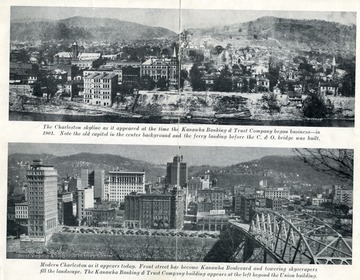 Charleston Skyline in 1901 (Top) and 1951 (Bottom,) Charleston, W. Va.
Charleston Skyline in 1901 (Top) and 1951 (Bottom,) Charleston, W. Va.
"The Charleston skyline as it appeared at the time the Kanawha Banking [and] Trust Company began business-in 1901. 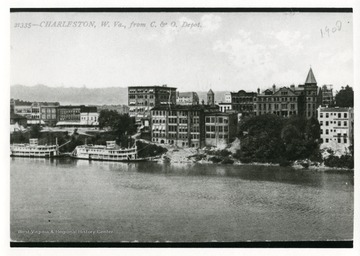 Note the old capitol in the center background and the ferry landing before the C [and] O bridge was built"; In the bottom picture, "modern Charleston as it appears today. 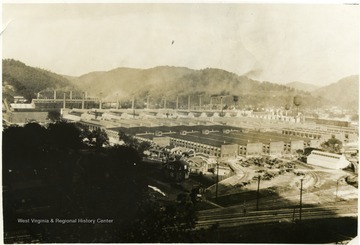 Front street has become Kanawha Boulevard and towering skyscrapers fill the landscape. 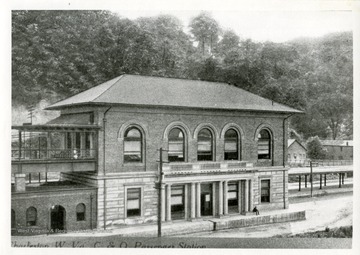 The Kanawha Banking [and] Trust Company building appears at the left beyond the Union building." 6. Libby Owens Glass Factory, Charleston, W. Va.
Libby Owens Glass Factory, Charleston, W. Va.
"Photograph property of Curt Teich [and] Co. Inc., Chicago." 7. 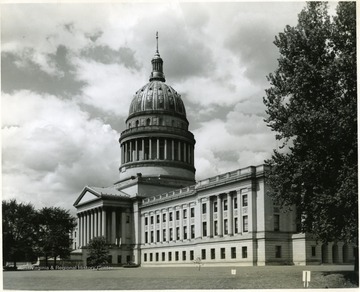 State Capitol Building, Charleston, W. Va.
State Capitol Building, Charleston, W. Va.
"W. Va. Indus. [and] Pub. Comm." 8. Bridge Across the Kanawha River at Charleston, W. Va.
Bridge Across the Kanawha River at Charleston, W. Va.
9. 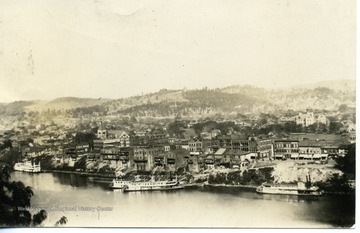 Steamboats at Charleston, W. Va.
Steamboats at Charleston, W. Va.
10. 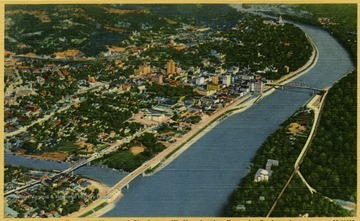 Aerial View of the Kanawha River and Charleston, W. Va.
Aerial View of the Kanawha River and Charleston, W. Va.
11. 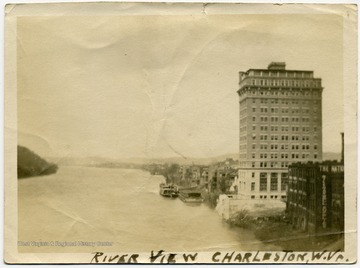 View of River and Buildings, Charleston, W. Va.
View of River and Buildings, Charleston, W. Va.
12. 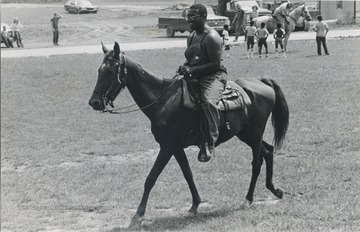 Ed Cabbell at 1977 John Henry Folk Festival, Camp Virgil Tate, Charleston, W. Va.
Ed Cabbell at 1977 John Henry Folk Festival, Camp Virgil Tate, Charleston, W. Va.
Ed Cabbell riding a horse during the John Henry Folk Festival in Charleston, W.Va.
© West Virginia University. West Virginia University is an Equal Opportunity/Affirmative Action Institution.